High Commissioner Babar Amin meets with Hon. Shayne Neumann MP, Shadow Minister for Immigration and Border Protection of Australia. High Commissioner Babar Amin met with Hon. Shayne Neumann MP, Shadow Minister for Immigration and Border Control in his office, to discuss issues of mutual interest between Pakistan and Australia. The Shadow Minister was informed about the meeting of the Joint Working Group on Border Management and Transnational Crime held in February this year. Pakistan and Australia shared the view of not politicising the FATF and retaining its technical nature. The High Commissioner appreciated the Australian assistance and training in curbing money laundering and terrorism financing, which, would be of great value in fulfilling the FATF benchmarks. 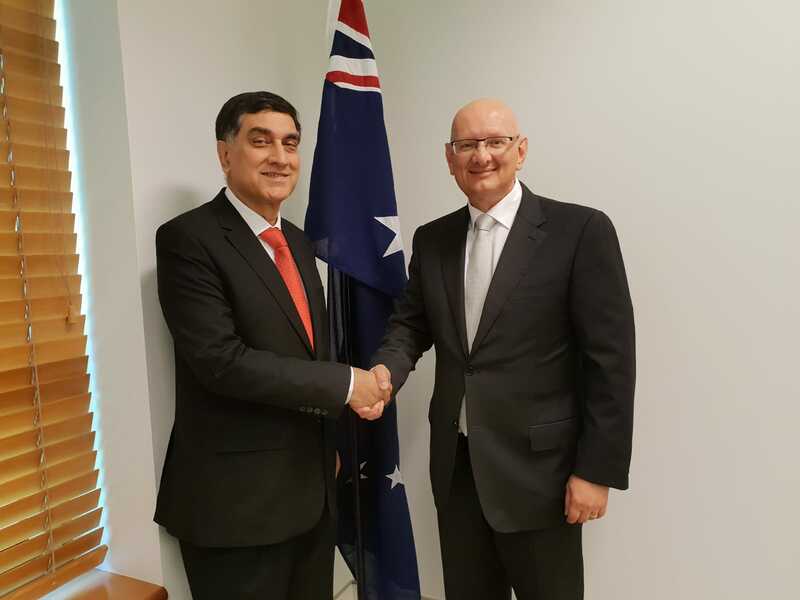 Referring to the remarkable improved security situation in Pakistan, the High Commissioner requested the Shadow Minister’s support for a positive revision of the Australian travel advisory on Pakistan. The High Commissioner also gave a detailed briefing on the current escalation in tensions in South Asia; and the maturity and restraint displayed by the Pakistani leadership despite strong provocations. The Shadow Minister was also briefed about the goodwill gesture of the Prime Minister of Pakistan to open the Kartarpur Shrine Corridor to facilitate the Sikh pilgrims. The travesty of justice in acquittal of all the perpetrators of Samjhauta Express terrorists’ attack in India, in which 44 Pakistanis had lost their lives, was also discussed. The Shadow Minister for Immigration and Border Control, Hon. Neumann expressed satisfaction over the bilateral relations and stated that the Labor Party fully supported further augmenting these ties. He emphasized that the Labor Party attached great importance to Australia’s security and intelligence cooperation with Pakistan. He appreciated Pakistan’s efforts to meet the FATF’s benchmarks. The Shadow Minister also agreed that the travel advisory should take into account the significantly improved security situation in Pakistan. He showed keen interest to know more about the peace and security situation in South Asia, Samjhauta Express attack, Kartarpur Corridor and raised numerous queries in this regard. The Shadow Minister Shayne Neumann, while taking note, thanked the High Commissioner for bringing these issues and the situation in South Asia to his attention.